Many see small quadrocopters as the future of surveillance, aerial photography, warfare and even construction, but a new demonstration involving a world record-setting swarm of 50 quadrocopters has shown the aircraft can also pull off some pretty impressive dance moves. 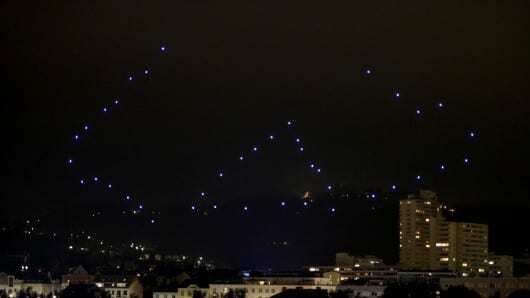 Outdoing the efforts of the University of Pennsylvania’s GRASP Lab, the quadrocopter swarm put on a choreographed air show over the river Danube in Linz, Austria, as part of the annual Klangwolke (Cloud of Sound) open-air multimedia musical event that kicked off on September 1st. The aerial display was put together by a team from Austria’s Ars Electronica Futurelab and Germany’s Ascending Technologies GmbH. The Ars Electronica team was responsible for creating the computerized choreography and equipping the standard model Hummingbird quadrocopters supplied by Ascending Technologies with special radio receivers and modified firmware. The vehicles were also equipped with LEDs to put on an eye-catching nighttime display.